Only trust shade sails on the Gold Coast made out of Rainbow Shade fabrics! For over 25 years now, Rainbow Shade has been supplying shade fabrics to shade sail manufacturers on the Gold Coast, and all over Australia. Our dedication to providing the highest level of quality and protection in each of our products is what has made us one of the country’s leading shade fabric suppliers. When you choose to buy shade sails on the Gold Coast made out of Rainbow Shade fabrics, you can count on ultimate all-weather protection. Rainbow Shade offers four premium shade fabrics for the manufacturing of shade sails on the Gold Coast, and Australia: Z16, eXtreme 32, DRiZ and Mehler. Z16 is the most widely chosen shade fabric for use in shade sails across the Gold Coast. Lightweight, durable and extremely resilient, this fabric offers safe, filtered transmission of light. Z16 also offers up to 99% UVR protection, making it highly suitable for use in both residential and commercial shade sails. 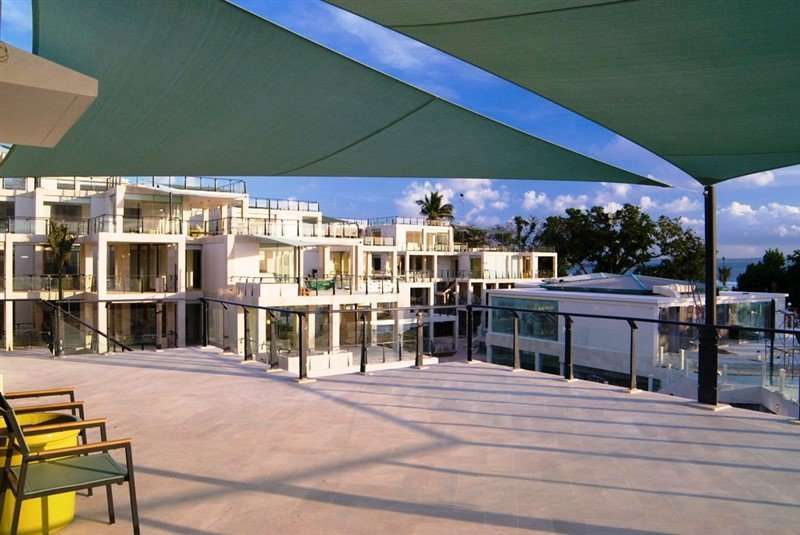 eXtreme 32 is most commonly used in commercial shade sails on the Gold Coast. This fabric features exceptional strength, high durability, tear resistance and high longevity. It also offers UVR protection of up to 95.8%. DRiZ is a special variant of Z16 that features a waterproof coating. It holds all the benefits that Z16 with the additional benefit of being waterproof. DRiZ offers up to 100% UVR protection and is very durable. Mehler is suitable for heavy-duty shade sails on the Gold Coast. This Germany based fabric features dimensional stability, flame retardant, waterproof, UV resistant and highly durable. Moreover, Mehler is exceptionally easy to maintain, making it the shade fabric of choice for many Gold Coast businesses. All Rainbow Shade fabrics feature one common trait – they are manufactured to the highest standards of quality. If you’re looking for shade sails on the Gold Coast, request your manufacturer to make use of Rainbow Shade fabrics. This way, your shade sail will offer you complete protection from the sun, wind and the rain. To know more about our high quality shade fabrics, please view our products. Why choose Rainbow Shade fabrics for your shade sails? No doubt you’re aware that Australia has some of the best weather in the world. However, this means spending a considerable amount of time in the sun and thus, shade sails are an absolute necessity. At Rainbow Shade, our mission is to provide top quality shade fabrics to shade sail manufactures on the Gold Coast, and across Australia. We are completely committed towards offering protection from the sun. That’s why our fabrics are designed to offer up to 99.9% UVR protection. Shade sails made out of Rainbow Shade fabrics offer excellent protection from the sun’s harmful UV rays. By installing shade sails at your residence or business location, you can reduce the risk of skin cancer significantly. Not just that, our shade fabrics are also incredibly resilient to other weather conditions such as rain, wind and hail. When you buy shade sails made out of our fabrics, you can be sure that your shade sail will protect you from harsh weather elements. We are indeed, proud to be the Gold Coast’s leading supplier of shade fabrics. Many shade sail manufacturers in the region are happy and satisfied customers of ours and we are constantly adding new clients to our list. We complement our outstanding products with a high quality of service. There is countless shade sail installations made from our fabrics across the Gold Coast. Car parks, swimming pools, schools and kindergartens, restaurants and cafes, all feature Rainbow Shade fabrics in their shade sails. If you’re based anywhere on the Gold Coast, including the suburbs of Arundel, Ashmore, Biggera Waters, Benowa, Broadbeach, Burleigh Heads, Bundall, Burleigh Waters, Coolangatta, Carrara, Coombabah, Currumbin, Coomera, Elanora, Helensvale, Gaven, Hope Island, Labrador, Jacobs Well, Main Beach, Mermaid Waters, Maudsland, Merrimac, Molendinar, Miami, Mount Nathan, Nerang, Mudgeeraba, Ormeau, Pacific Pines, Oxenford, Palm Beach, Parkwood, Paradise Point, Pimpama, Robina, Reedy Creek, Runaway Bay, Surfers Paradise, Southport, Tallebudgera, Upper Coomera, Tugun, Varsity Lakes, Yatala, Worongary or anywhere in between, you’ll find a shade sail manufacturer near you who uses Rainbow Shade fabrics. Don’t ignore the importance of being protected from the sun. Only trust shade sails on the Gold Coast that are made from Rainbow Shade fabrics. Get in touch with us and we’ll put you through to your nearest shade sail manufacturer who uses Rainbow Shade fabrics.